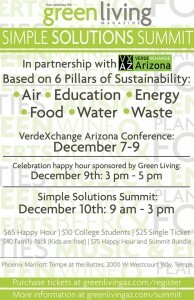 Join our friends at Green Living Magazine for their first annual Simple Solutions Summit! Simple Solutions Summit December 10th 9:00 a.m.- 3:00 p.m. Whether you’re passionate about sustainable education, purchasing local food and goods, growing groundwater concerns, saving energy, reducing the amount of waste you produce, living healthier, or exploring more ways to live an eco-conscious life, the Simple Solutions Summit is the optimal event to continue educating, inspiring and empowering yourself and your family. This event features something for everyone as we grow as a community and TAKE ACTION. Those who attend the VerdeXchange will have to pay to attend the Summit.